HAYS, Kan. – Dr. Laura Wilson, associate professor of geosciences and chief curator of the Sternberg Museum of Natural History, and Kristopher Super, an alumnus of Fort Hays State University who is now a graduate student at the University of Kansas, have coauthored a research article published in the journal Nature. “This is a rare accomplishment for most universities, but it is especially noteworthy for a teaching-focused institution like FHSU,” said Dr. Grady Dixon, chair of the Department of Geosciences at FHSU. 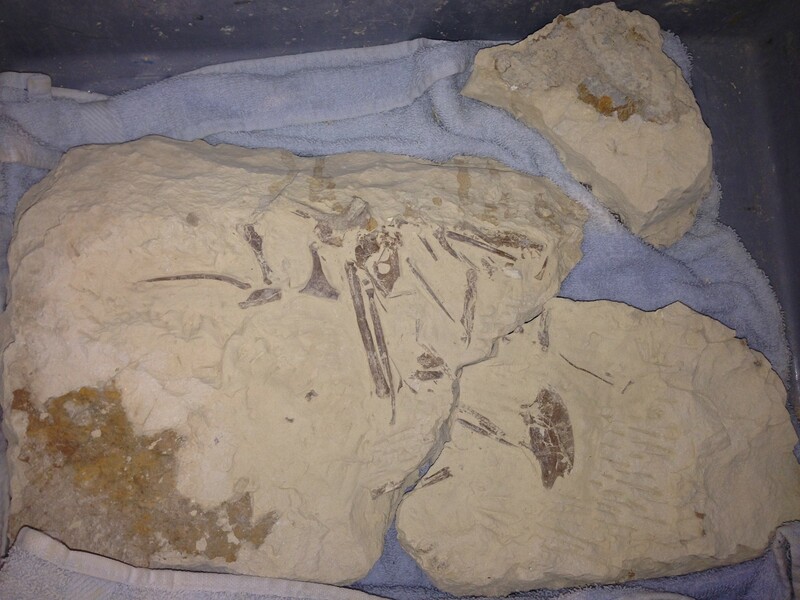 In late summer of 2014, just a day before classes began, Super found a fossil of a bird (Ichthyornis dispar) skeleton surrounded by chalk in Gove County, Kansas. He was about to start his freshman year at Fort Hays State. Super said he didn’t think too much about it when he first found the fossil, mainly noticing how the bone had weathered. Fish bones, for instance, erode differently than, say, pterosaur or mosasaur bones when exposed to the elements. Super began cleaning the bones with small amounts of water but stopped once he began to find skull bones. Wilson, his advisor, knew immediately that this specimen was significant. The next step was to learn more about what the rock may have been hiding. Exposing fragile fossils from rocks can be tricky, so CT scans can be helpful. Fort Hays State does not have the necessary equipment, but Wilson and Super enlisted the help of HaysMed. The initial CT-scans and X-rays, said Wilson, enabled the researchers and their collaborators to understand more about the size and placement of bones in the rock. This information was used to carefully expose the bones from their earthen case so they could be studied. Over the next few years, Wilson and Super, who earned his Bachelor of Science in geosciences from FHSU in 2017, joined a team of experts from Yale University, the University of Kansas, the Alabama Museum of Natural History, Tuscaloosa, and the McWane Science Center, Birmingham, Ala., all keen on better understanding bird evolution. The team eventually used the fossil, in conjunction with other previously known specimens, to reveal the significant role of Ichthyornis dispar in understanding the transition from dinosaurs to modern birds. Specifically, I. dispar possesses a mix of dinosaur-like and bird-like characters that illuminates that transition. Super has been collecting specimens in the Kansas chalk since he was about 10 and has donated multiple fossils to Fort Hays State’s Sternberg Museum and to the University of Kansas. “I also have a field journal that records the localities for my fossils going all the way back to 2009. Keeping detailed records is very important,” he said. These findings are so significant that the team recently published their work in Nature, which is one of the most prestigious science journals in the world. “We believe that this is the first FHSU-affiliated publication in Nature in at least 17 years, and it is the first time for an FHSU student to be involved in research accepted by Nature,” said Dixon. “Many researchers at research-intensive universities spend their entire careers trying to get a paper into either Nature or Science, which are widely considered to be the two most prestigious journals for scientists,” he said.